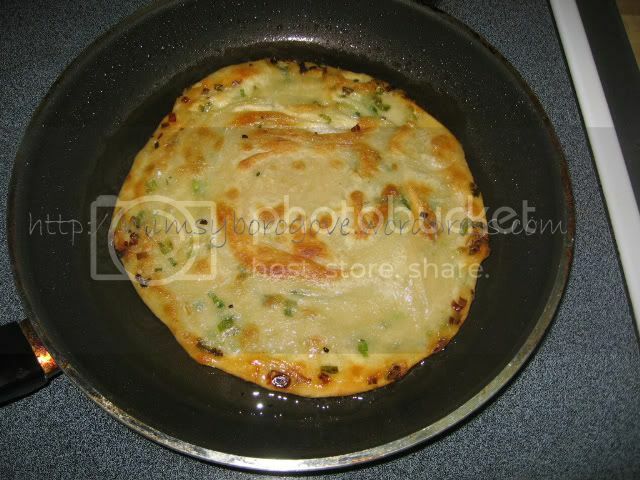 Scallion Pancake frying in the pan! Just a quick drive-by to share some deliciousness. 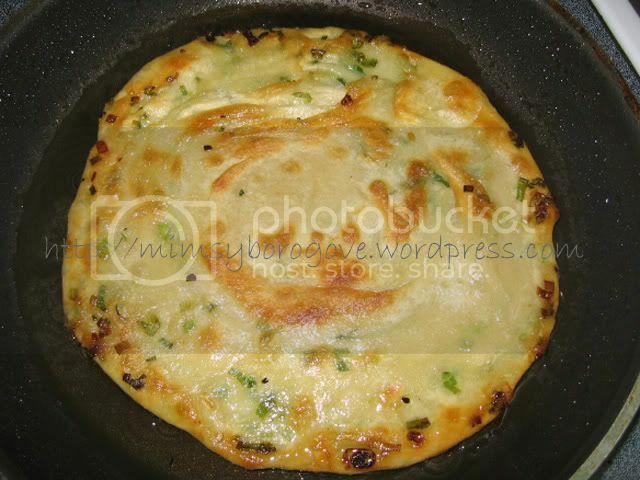 I made some scallion pancakes over the weekend and they were crispy pieces of heaven. My family prefers them a little on the chewy, more doughy side. I like them thin and crispy; the crispier the better! They were relatively simple to make. I followed a recipe from the Chinese newspaper, translated courtesy of mom because I can’t read a lick of Chinese. I have no problem understanding spoken Chinese; it’s the written form I never got the hang of as a kid. Anyway…the only annoying and time consuming parts of making the scallion pancakes were the kneading and resting process. Otherwise, it was easy peasy. Check out more tasty pics after the jump. The trick to getting them crispy is to use a lot of oil and shallow fry the pancakes. You don’t want it swimming in oil. You’re not DEEP frying it after all (mmm…that would probably be tasty too) but you want enough oil so that the pan doesn’t get “dry.” I would say 1 to 2 Tb of oil should be in the pan at all times as you’re frying up each pancake. Otherwise, if there’s not enough oil, the pancakes will still get brown but they won’t get crunchy. Also, have some newspaper laid out with paper towels on top. When you pull the pancakes out of the skillet, place them on the paper towel lined newspaper to drain of excess oil. I like to serve them by cutting them into wedges with a pizza cutter or kitchen scissors. This entry was posted in Chinese food, food. Bookmark the permalink. 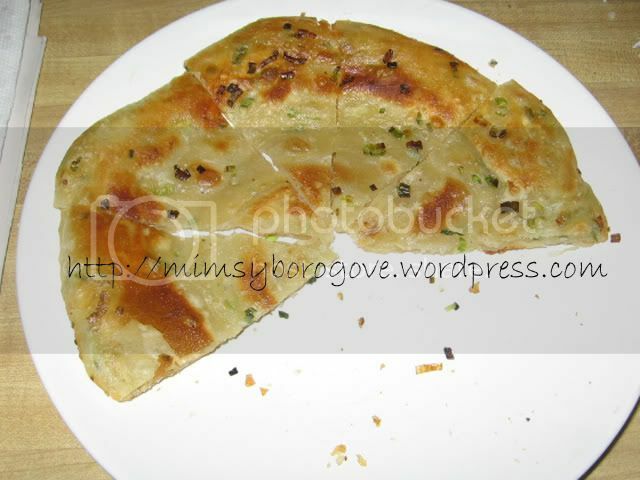 >Scallion pancakes are so delicius! My mom's a neat freak so I'm almost banned from the kitchen. Guess I'll get my fix at the market.Anyway, I overread your post on Nouveau Cheap and there's an affordabe waterproof eyeliner that you could try. It's the Styli-Style waterproof liner (I think…) and they come in several shades. I've experienced a bit of creasin– but I've got oily lids. It's the best pencil liner I've tried (even better than my Estee Lauder ones). If you come across one, pick it up and see if it works for you. Oh, and I can't read Chinese either (though I have no problem speaking/understanding it). Poo. >I don't think I've ever met a scallion pancake I didn't like ;)Thanks for the tip on the liners. I've never tried anything from the Styli-Style brand but the w/p liner sounds like a good place to start. I'll be sure to try it out.Nice to know I'm not alone in being a bilingual/Chinese illiterate 🙂 I keep telling myself I'll learn someday!